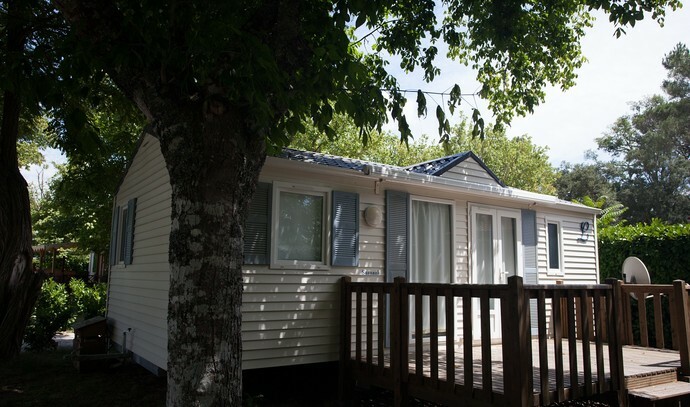 Our mobile home Villa, ideally situated in a calm zone of our 10 hectares park, is the perfect place for a resourcing holiday! The inside of this 29m² accomodation is composed of a large living room with open kitchen, a parents' room with double bed (140cm), a bathroom with toilet and a kid's room with a simple bed (90cm). In the living room, a convertible sofa can turn into a bed for two persons, allowing you to come to Lit et Mixe in family (5pers. max). A raised terrace, accessible thanks to a ramp, allows you to fully enjoy the mild climate.